Wet puddlers and agitators are machines that are used to separate opal from the claystone in which it is found. They are essentially large mechanical sieves that use water to promote the disintegration of the claystone to leave a residuum of opal and harder rock fragments (tailings). Commencing in the mid 1960s, various forms of wet puddlers and modified concrete agitators were introduced to the Lightning Ridge region to speed up the process of recovering opal (Len Cram, personal communication). More than 90% of the nobby (nodular) opal currently mined (2002) from areas such as the Lightning Ridge, Wyoming, Coocoran, Jag Hill, Allawah and Mehi opal fields is recovered using agitators. 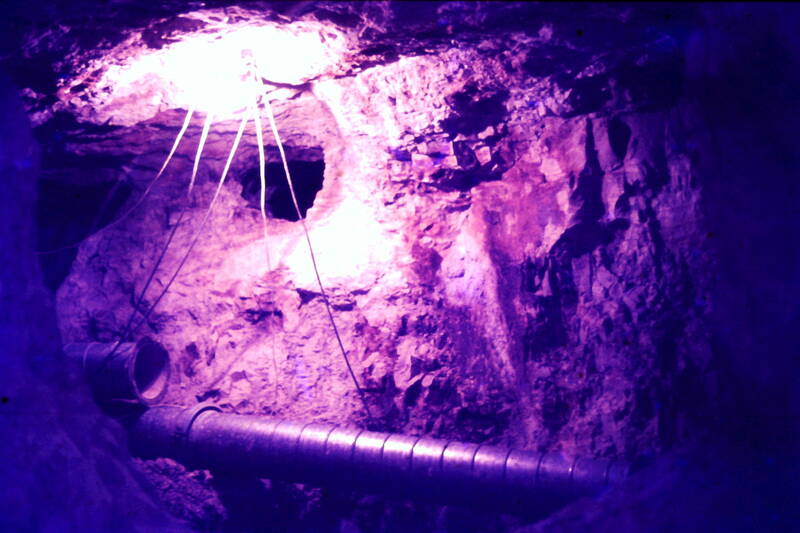 In seam opal mining areas, such as the Grawin, Glengarry, Sheepyard, Carters and Mulga opal fields, agitators are uncommon as the opal is usually recovered at the working face of the mine. When mixed with water most opal bearing claystone disintegrates relatively quickly into a fine slurry. The disintegration process is enhanced by physical movement of the claystone and water mixture. 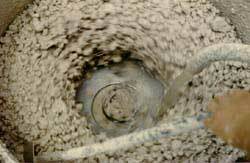 The slurry will flow and can be dispersed from the puddler or agitator by passing it through 6mm (1/4 inch) mesh. The residuum of several truckloads of opal bearing claystone may be less than 200 litres in volume and consist of pieces of common opal (potch), precious opal (if any) and harder rock fragments. A puddler is typically composed of a basket made of steel mesh with a rotating plate at the bottom that is driven by an external power source, such as a tractor, through a modified differential from a truck. 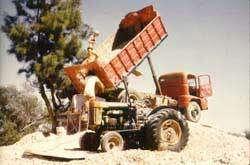 An agitator is commonly constructed by modifying a second hand agitator from a concrete truck, although some miners also use purpose built claystone processing "agitators". A number of holes are cut in the side of the agitator barrel and these are covered with steel mesh. 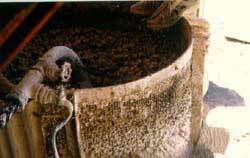 In operation, the agitator rotates like a normal concrete agitator except that the slurry (silt) passes from the agitator through the mesh. Silt resulting from the operation of puddlers and agitators is retained in earth dams which adjoin the sites where processing operations are undertaken. Tip truck dropping opal bearing claystone into a wet puddler. Side view of a wet puddler. View inside the basket of an operating wet puddler.